Driven by a sense of guilt from over-indulging in rich foods the week before, I decided to bake a protein-rich dinner on a recent weekend. This recipe was improvised according to my random cravings (salmon, yellow peppers!) while I was at the supermarket and I was glad to see that it’d worked out rather well! a. Lightly rinse and pat the salmon fillet dry with kitchen towels. b. In a bowl, whisk and combine the marinade’s ingredients – miso paste, light soy sauce, rice wine / mirin, sugar, sesame oil and a generous dash of ground ginger powder. 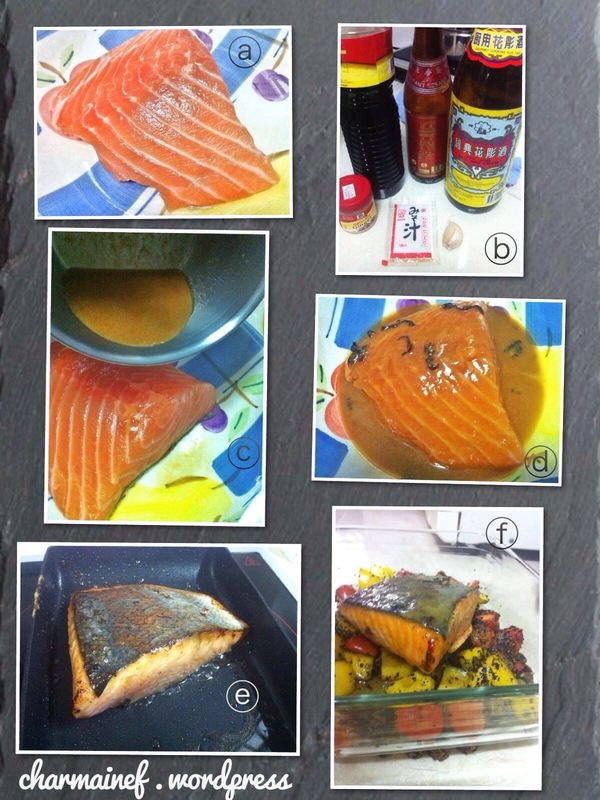 c. Pour the marinade over the salmon fillet and generously coat it. d. Cover the dish with cling wrap and marinate it in the refrigerator for an hour. Meanwhile, drizzle some olive oil and add some salt and pepper to the baking dish and roast the vegetables at 220 degrees Celsius for about 5 – 7 minutes. e. Heat a teaspoon of oil in a frying pan and lightly sear both sides of the salmon fillet (4 minutes on the side with the skin first and 3 minutes on the other side). 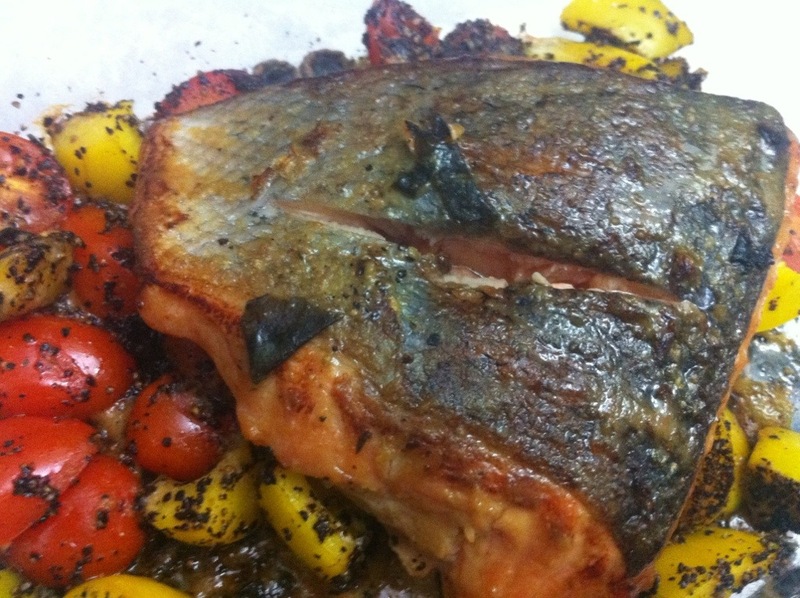 f. Remove the roasted vegetables from the oven and carefully place the salmon in the middle of the dish. Pour the oil from the pan on the vegetables and remaining marinade on the salmon fillet, and return to the oven for another 8 – 10 minutes of baking at the same temperature.